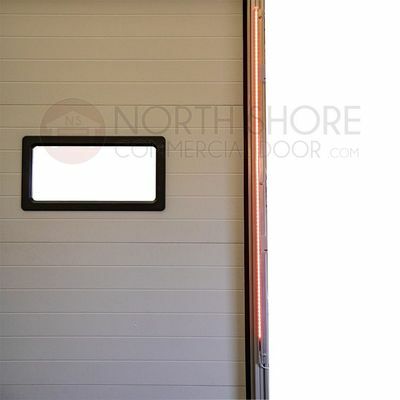 North Shore Commercial Door - Materials Handling - Commercial Facilities, Plants, Loading Docks & Bays, Etc. Material handling is a fundamental division of the manufacturing industry. North Shore Commercial Door offers a variety of material handling solutions intended to keep your facility running smoothly and efficiently. Our pre-packaged Dock Leveler Seal Kits are designed to keep out dirt, pests, and drafts so they are excellent for the food industry. The weather-tight, "drive-in" Dock Shelters are designed to create a positive seal between dock and building, allowing full access to delivery trucks or other vehicles while promoting a comfortable and safe environment for personnel. Molded rubber and laminated Wheel Chocks to prevent accidental vehicle movement are available in two different sizes. 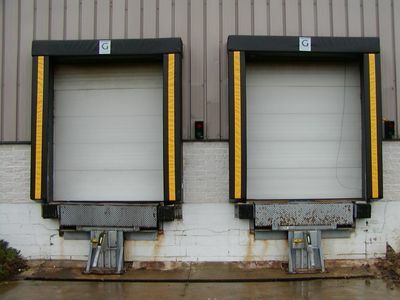 Finally, our Laminated Dock Bumpers will prevent vehicle damage to your building or loading dock. We carry a variety of models to suit your needs. If you don't see what you are looking for or have any questions about our material handling products, contact our friendly staff by phone at 1-800-783-6112 or via direct chat, Monday through Friday between the hours of 8 a.m. and 4:30 p.m., Eastern time. Or, send your question anytime via e-mail to support@northshorecommercialdoor.com and a North Shore representative will respond as soon as possible. PVC Strip Doors by Gateway Industrial Products, Inc. The Bug Barrier by Gateway Industrial Products, Inc.
Dock Seals & Shelters by Gateway Industrial Products, Inc.